Nationwide, there are 107 million unmarried American adults according to the 2014 Current Population Survey. This represents 44.5% of all adults 18 and older. Nearly 3% of all unmarried adults nationwide—3.2 million—live in North Carolina. Unmarried adults comprise 43.2% of North Carolina’s adult population. Across the United States, the share of unmarried adults ranges widely. The District of Columbia has the highest share of unmarried adults: 68.7%. This is the only region where a majority of adults are unmarried. 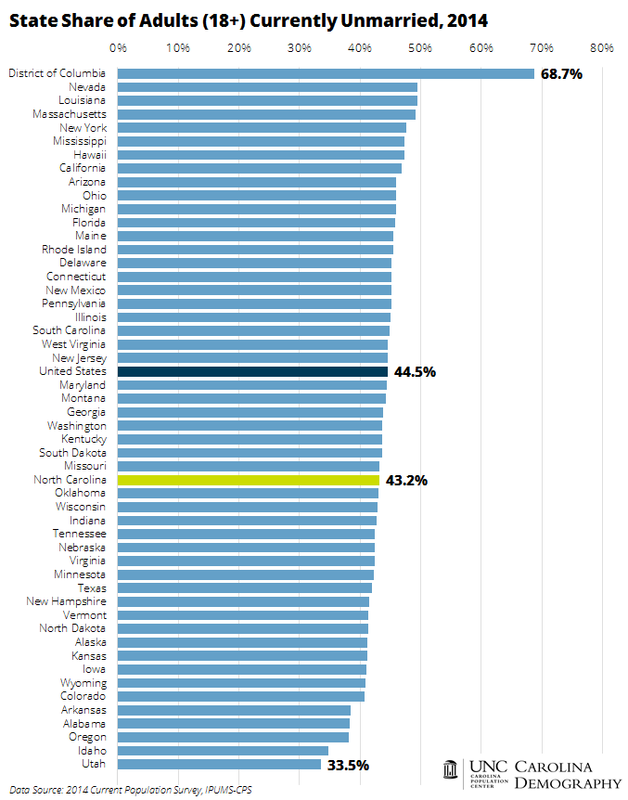 Nevada has the second highest share of unmarried adults, followed closely by Louisiana. In both Nevada and Louisiana, 49.4% of adults 18 and older were unmarried in 2014. At the other end of the spectrum, Utah has the lowest share of unmarried adults. Only one in three Utah adults are unmarried. There are only four other states—Idaho (34.8%), Oregon (38.1%), Alabama (38.3%), and Arkansas (38.4%)—where fewer than 40% of adults are unmarried. This entry was posted in Carolina Demographics and tagged adults, Current Population Survey, marriage, single, state by state, unmarried. Bookmark the permalink.